The American Dental Association (ADA) recommends that all children and adults floss their teeth once per day. The process is easy and inexpensive, with no risk of harm, and can help prevent gum disease and tooth decay. Yet, many people know very little about this easy way to improve oral hygiene. Here is a complete guide to flossing teeth. Removing Food Debris and Bacteria: Food debris and bacteria can easily penetrate the spaces between and around the teeth, increasing the risk of tooth decay. Flossing removes these items before they can cause harm. Protecting the Gums: Flossing also removes bacteria and food debris from the gum line. Gum disease starts with mild irritation known as gingivitis, but it can slowly lead to tooth loss. Flossing can stop or even reverse early gum disease. Saving Money: Besides brushing, flossing is the least expensive form of dental care. Why gamble on pricey treatments down the line, when you can invest a few cents and a few minutes per day to keep your mouth healthy? 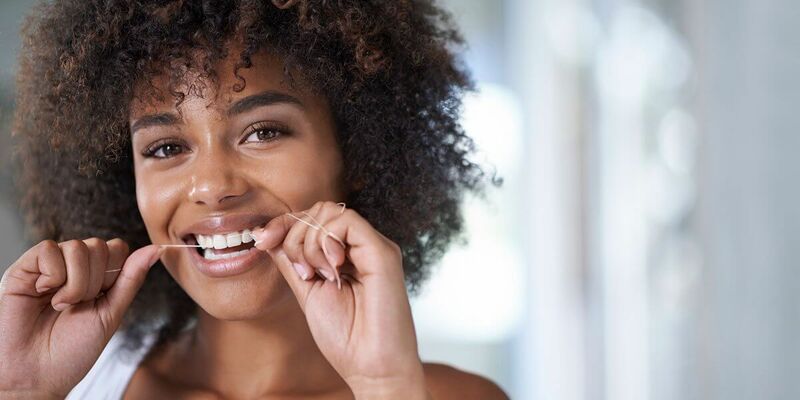 Improving Health: Flossing can dramatically boost your oral health, and it can help to prevent the dangerous systemic illnesses that can result from tooth decay. Cosmetic Improvements: No one wants to be seen with stained teeth or food stuck between their teeth. Flossing helps ensure that your beautiful smile is the best it can be. “Flossing” refers to interdental cleaning, or cleaning between the teeth. Most people are familiar with dental floss, made from strands of filament and possibly waxed and flavored. Other options include wooden or plastic interdental cleaning tools, as well as the Waterpik, which uses a jet of water. Your dentist can help you choose the device that best meets your needs. Pull out approximately 18 inches of floss. Wrap it around your middle fingers, leaving a one to two-inch gap between them. Use your thumbs and index fingers to hold the floss taut. Place the floss between two adjacent teeth, and firmly but gently slide it up and down. Gently slide the floss to the base of one tooth in the pair, carefully working it beneath the gumline. Then repeat for the other tooth. Move to a clean area of the floss and repeat the process between and then at the base of the next two teeth. Continuing moving around your mouth until all teeth have been flossed. Flossing is a simple and effective way to boost your oral hygiene, but many people are unaware of how to do it. Follow the above tips, and never hesitate to ask your dentist or hygienist for additional instructions or even a demonstration. If you would like to learn more or start your journey to dental health, please contact Dental Associates, LLP, at 860-677-8666 to schedule an appointment. Welcome to Dental Associates! Service is at the core of everything we do. Our team works together to provide a warm, comfortable, and relaxing environment. Call us at 860-677-8666 to schedule your appointment.